Guess what? The Bible was written about real life and for real life! If we’re only hearing it in church, or if it is only about how to get to heaven, we are missing the point. Jesus said his purpose is to give us a “rich and satisfying life” (John 10:10 NLT). Some translations say he wants us to have life abundantly. The cool thing is that God doesn’t expect us to just instantly zap into “abundant life” mode. Instead, his Word is full of instructions and stories to help us figure out how to live that abundant life. We’re after life-changing Bible study. 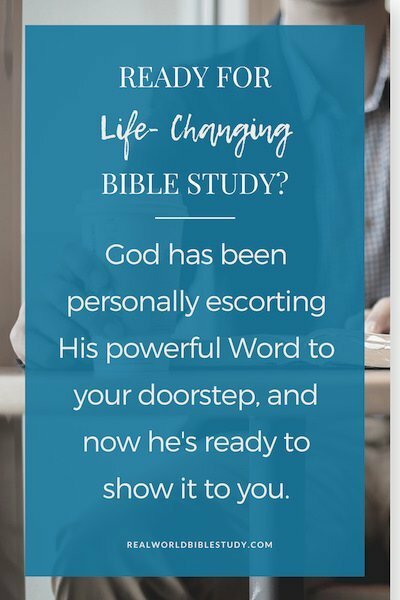 Bible study is one of the most important spiritual disciplines, and Real World Bible Study connects God’s Word to your daily life. It develops real-world theologians. A theologian is a person who studies theology (the study of God), and while some theologians study God for a living, I want you to be a real-world theologian, studying God for living. If there is a “real-life” problem you have, I can guarantee you there is a Bible hero just like you. So how do you get to know those heroes? 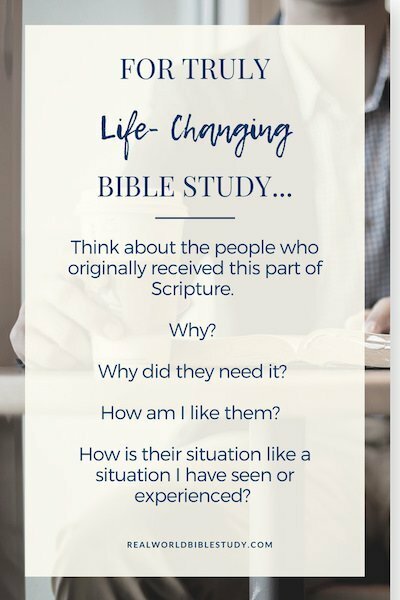 You’ve heard that Bible Study will change your life, but how do you actually get started with life-changing Bible study? Or if you’ve done it before, how do you make sure you’re on the right track? #1 The Holy Spirit is the #1 Most Important Thing for Life-Changing Bible Study. Doing Bible Study with the Holy Spirit is like visiting a tourist site and getting a tour guided by the original owner. We all have things in the Bible (and the rest of life…) we don’t know or understand, but the Holy Spirit knows and understands all of it! He was there from the very beginning at the time of creation (Genesis 1:2). Way back when all those things in the Bible happened, the Holy Spirit was part of making those things happen! Then, he was there, inspiring someone to write about it (1 Timothy 3:16). Then, he was there guiding which books ended up in the Bible and which ones didn’t, and he was there guiding translators and scholars and every fingerprint that touched that Bible until it ended up in your hands. He has been personally escorting this powerful Word to your doorstep, and now he’s ready to show it to you. Jesus promised that the Holy Spirit would teach us and remind us of everything he told us (John 14:26). So how do we do Bible Study with the Holy Spirit? First, we ask! Start your Bible study time with prayer and ask the Holy Spirit to guide you and speak to you as you study. Second, we need to create a little space, a little quiet, and a little time for reflection. It’s not about having the perfect space or perfect peace and quiet, and for some of us, that isn’t even an option. This is Real World Bible Study, after all! But as much as you can, create a small pause to pray and listen, and create a space in your life to reflect and think things over. When you ask him to, the Holy Spirit will participate in that thought-conversation. We learn to hear God speak to us through his Word. The place to pause and think, by the way, doesn’t actually have to be in the time you are doing your Bible study. It often helps me to let things “percolate” (like coffee does) and let it brew in your head and in your heart. I’ve had some of my best life-changing Bible study reflections on a long car ride, a lunchtime walk, or even at the gym where I’m stuck in one place and my mind has the chance to turn things over. My friend Jill ends her workout with a 60 second Prayer Plank. The point is to have some intentional (read: on purpose) time to process your study and/or your day in conversation with the Holy Spirit. Otherwise, it’s like sitting next to someone on the airplane and not actually talking to them. Or worse, sitting next to someone who is talking to you and you have your headphones in. 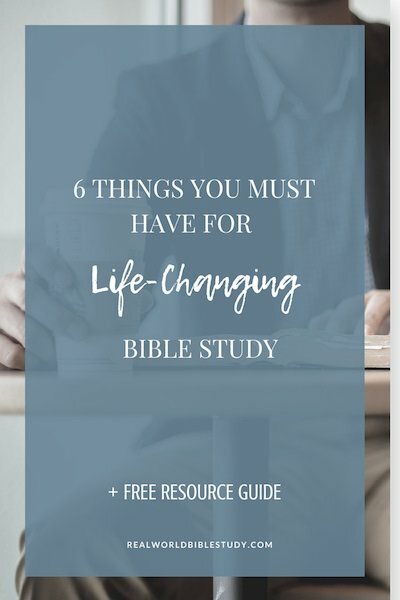 #2 Want Life-Changing Bible Study? Translations DO Matter. Once, while leading a small group, I handed a friend a Bible in a translation she had never heard of – the Common English Bible. I don’t know if it changed her life, but I know what she told me: “I actually understand this!” Here’s the thing: the Bible was written for everyday people. Actually, much of it was written to be read out loud to everyday illiterate people. I don’t mean illiterate like a second-grade reading level. I mean, really illiterate. The New Testament was written in what scholars call “Koine Greek” – common Greek, not college-graduate Greek. Each part of Scripture was made to be read aloud to, and understood by, people who couldn’t even read! If you’re having trouble connecting, you might need a better translation. You want a translation that you can understand as you read; you should be challenged by the Word of God, not by the physical act of reading it. Some parts of the Bible are going to be tough to understand without having the translation get in the way. You also need a translation that is based on really good scholarship. I’m not going to get into the nitty-gritty in this post, but not all translations are created equal. A few of my favorites are the Common English Bible (CEB), the New Living Translation (NLT), and the New International Version (NIV). If reading is tough for you, the CEB and NLT are great options, or there is also the New International Readers Version (NIrV), which is based on the NIV but written at a third-grade level, not just for kids but for readers of all ages. For more detail on the difference between translations and how to choose a good one, check out How to Read the Bible for All Its Worth by Stuart and Fee. The translation discussion is in chapter 2, and I’ll make sure to add a blog post soon about choosing a translation as well. One more thing about translations: You need to do Bible Study with an actual translation, not a “paraphrase” like the Message or the older “Living Bible.” What’s the difference between a translation and a paraphrase? A translation is based on the original language and is translated word-for-word or thought-for-thought, or (best case) a balance of those two. With a paraphrase, the writer takes a translation and puts it into his/her own words. A paraphrase can be useful because it can help you think about a scripture with a different lens, but you don’t want to start your Bible study or base your Bible study on a paraphrase, because then you are studying someone’s interpretation rather than the Scripture itself. You might find yourself putting weight on a word or phrase that isn’t even in the original language – yikes. It’s okay to have a paraphrase in your toolbox, but you need to rely on a good translation as the basis of your study. Sometimes you can pick up the Bible and read something and just get what it means and how it applies to you. “Children, obey your parents in the Lord, for this is right” is a classic example (Ephesians 6:1). But most of the time, you need to understand the context – where it fits – to understand what it means and what it means for your real life. You need literary context: where it fits within that book of the Bible and the rest of Scripture, and especially what genre you are reading. And you need historical context: where does it fit in history? What was going on back then and what did it mean to the original audience? I discuss this more in my post on interpreting the Bible. Knowing where it fits, especially the historical context, will help you figure out where you fit. What situation back then is similar to what situation now? You can build a bridge from then to now. How can you learn about the context? A good Study Bible will give you the basics of a book of the Bible: when and where it was written, audience, situation, etc. Another favorite resource is Stuart and Fee’s How to Read the Bible Book by Book (the companion to How to Read the Bible for All Its Worth). It also helps to use a study guide for the particular book you are studying; the good ones have a lot of that background information as well. If you want to go deeper, resources like commentaries and Bible dictionaries can also help you get some great background information. 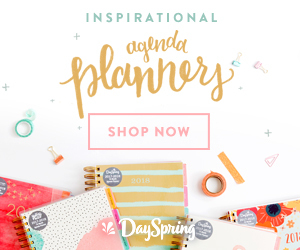 Here are some of my favorite life-changing Bible Study resources to help you get started. As you do your Bible study, it helps to have an idea of what questions to ask. I’ve created a free printable study guide that you can use to go through these “context” questions for each book of the Bible you study. 75% of Scripture is story, and story was one of Jesus’ favorite ways to teach. There’s a reason: we learn through story. Life-changing Bible study takes us out of abstract ideas and rules and into story, full of concrete, relational thinking we can wrap our brains around. This is God’s story of his interactions with his people over thousands of years, and it’s our story, too. Story helps Scripture come alive to us and connect it to our daily lives, which is the idea, right? A lot of times, we think of Bible stories as something for little kids. But the truth is that stories are a great way to learn what God has for us in a way we can carry with us. They invite further discussion and can open all sorts of fun cans of worms. How can I use story in my Bible study? First, make sure you know the context (see above). This will help you understand the story you are reading. Second, even if you are reading a part of scripture that is not in the narrative genre (not written in story form), remember that it is actually part of a story; there is a story behind it. All those rules and laws in Leviticus are part of the story of Exodus as the Israelites are on their journey to the promised land. Paul’s letters in the New Testament have stories too; some are part of the story of Acts, and some reference their own background and stories during the letters. For truly life-changing Bible study, start thinking about the people who originally received this part of Scripture. Why? Why did they need it? How am I like them, or how is their situation similar to a situation I have seen or experienced? How is the concept being taught like a situation in my life? As you go, make sure you are practicing the rules of interpretation. And third, practice telling the story to other people: your friends, your kids, your followers on Facebook live. Don’t necessarily start with telling them what it means; start by asking them the same questions. As you practice, you will start to naturally memorize the story and gain an even greater understanding of it, and then you’ll be able to pull it out of your back pocket when needed in a real-life situation. Did you know that even fiction is a great way to use story to interact with the Bible? Read more about why Christians should read fiction here! #5 For Life-changing Bible Study, Get Stylin’. No, I don’t mean being super trendy with the clothes you wear. I mean that we all have different personalities, we are all in different life situations, and we all learn in different ways with different strengths. This is a good thing, and it is part of why being in community is so cool. There are many different methods and types of Bible study tools out there. Some will fit you better than others based on your learning style, level of nerdiness (ha!) and where you are in your walk with God. There’s no rule that says you have to use a certain one. If you are having trouble connecting with one study guide or study method, don’t give up…try a different one. Life-changing Bible study uses written word but also video, audio, and visual methods, together if possible. It is active and interactive, discussion-based. According to William Glasser, we learn more when we combine methods and when we discuss what we learn with others. Some styles will come more naturally to you than others, and that’s okay too. Remember that God’s Word was first learned by a community that was largely illiterate. If they could connect with God through his Word, and they couldn’t read, then you can connect with God’s Word too! Take some time to get to know your learning style, and then look for studies that are going to work well with that style. Your learning style can help you develop a good learning strategy for Bible study. The key is to keep trying different styles and play around with them until you find the mix that works for you. We weren’t created to do this thing alone – even introverts like me. We interpret the Bible with the power of the Holy Spirit and in the context of community. Community helps us engage with God’s Word; as William Glasser said, we learn 70% of what we discuss with others. Doing Bible study with others challenges us to see how this teaching applies to different situations in different seasons. Community Bible study invites us to hear different interpretations and different perspectives. Community also helps us tell the difference between a God idea and a brain fart. We catch each other’s bloopers, and we learn from those who have more or different experiences than us. Finally, community keeps us accountable. 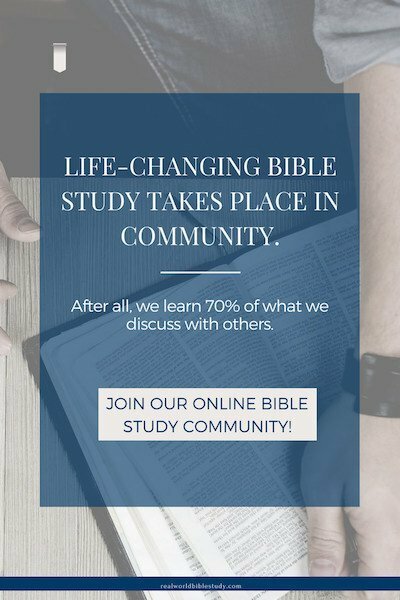 What Does Life-Changing Bible Study in Community Look Like? There are many ways you can do Bible study in community. You definitely want to be part of a local church. That should be the first place you start, but don’t just show up on Sundays. Invest in relationships. A small group Bible study will allow you to build close relationships and connect with God’s Word and each other. You can also discuss your Bible study with your family over breakfast or with your friends. 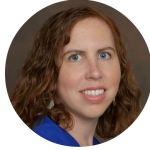 And while in-person relationships should come first, there are great Facebook groups and other ways to find community on the web too. You can even supplement your close in-person friendships by discussing your Bible study on Facebook or on a blog. For some people, that gives them the opportunity to interact throughout the week. Need a place to belong and connect? We would love for you to join our Real World Bible Study Facebook group; it is a great place to ask questions and bounce ideas around! If all this feels overwhelming to you, just take baby steps! Choose one of these areas that you want to work on over the next few weeks. The same thing goes if you’re an old pro; we all need to recalibrate the system every once in awhile! Leave a comment below! Let me know which idea you want to focus on. What steps will you take to get there? Don’t have the steps? Let us know in the comments and we’ll walk you through it!